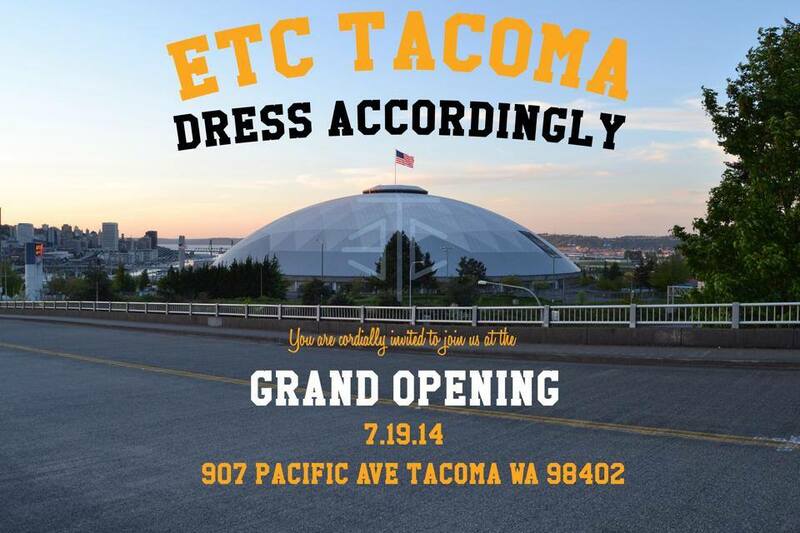 On July 19, eTc Tacoma will open its first streetwear brick-and-mortar location. Located downtown at 907 Pacific Ave, eTc Tacoma will have exclusivity with 100% of the apparel brands and 95% of the accessory brands carried in store. This exclusivity will create the destination shopping atmosphere a streetwear boutique demands. The boutique’s open floor design and seating area invite patrons to stay beyond their purchase and indulge in the cultural aspect of the store. eTc Tacoma’s store culture is an annex for debates on the subculture of streetwear, social network news, trends and fads, and even worldly issues. Please stop by–buy something you can’t get anywhere else in WA–and spread the word, which is the spirit behind the brand and Etcetera’s company slogan of “Dress Accordingly”. Founded in Tacoma, Etcetera is a graphic t-shirt and accessories brand that was exclusive to the region and produced in limited quantity. The purpose of the product has been to promote local entrepreneurship in Tacoma as well as be a driving force in familiarizing the community with eTc Tacoma as a brand before its grand opening. The independent clothing boutique subculture is the ground floor to a rapidly growing portion of the fashion industry, and eTc Tacoma is in prime position at “907” to lead the region in this subculture and to become the cultural hub of Tacoma. 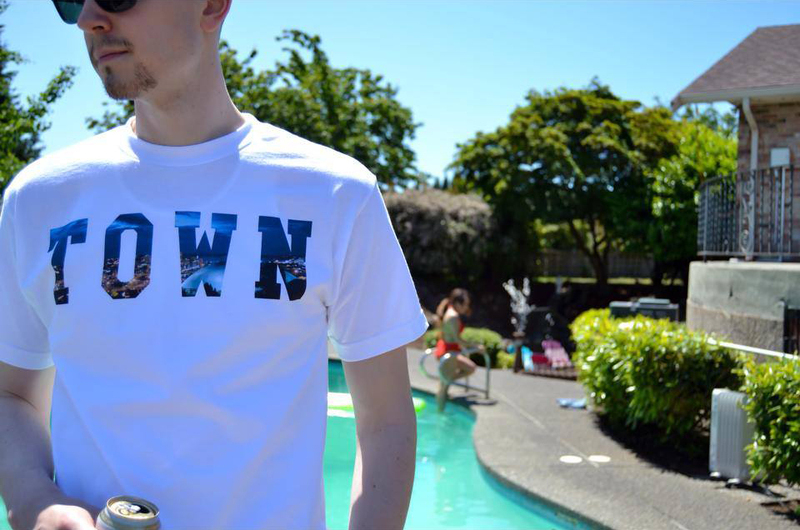 TOWN tee. Available only at the Grand Opening. July 19th. Photo by eTc Tacoma. In 2006, Founders and Creative Directors of Etcetera and eTc Tacoma, Umi Wagoner and Perris Wright were seniors at Foss High School when they were inspired to start a brand. It became a business while Wright was in college earning his business degree from Eastern Washington University. While at the Fashion Institute of Design & Merchandising in Los Angeles, CA, Wagoner was earning his degree in merchandise marketing. With eight years of retail management experience, and a lengthy stint with the LA-based streetwear juggernaut The Hundreds (http://thehundreds.com/thank-umi/), Umi brings back to Tacoma a background in streetwear and retail that is very rare. Backed by Marketing Director Prince Alexander and Graphic Designer Matt Headley, the brand and boutique are bound to propel downtown Tacoma into a destination shopping area and inspire other niche retailers to chance their luck–from the rails to the sails–and help build the TOWN. Please join Etcetera for the grand opening of their streetwear boutique eTc Tacoma (907 Pacific Ave) on Saturday, July 19th (11AM-7PM). From 8PM-10PM, in-store performances take place and are headlined by Bumbershoot 2014 performers ILLFIGHTYOU (http://www.sandlotsdugout.com/) with openers Leon Swanks and Jrm & Jai. For press images, interviews, or additional information please contact Prince Alexander at 253.293.1676 or at prince@etctacoma.com, or please visit the official Etcetera website at www.etctacoma.com. eTc Tacoma was accepted into Spaceworks Tacoma in February 2014, then participated in the Spaceworks Creative Enterprise Training Program and during this time was able to identify a space and sign a lease on their own. Spaceworks is proud to support creative entrepreneurs like eTc Tacoma as they launch exciting new businesses in downtown Tacoma. Spaceworks Tacoma, a joint initiative of the City of Tacoma and the Tacoma-Pierce County Chamber, is designed to activate empty storefronts and vacant space in Tacoma. For questions about Spaceworks Tacoma, please contact Spaceworks Manager, Heather Joy at 253.682.1722 or heatherj@tacomachamber.org.